In July 1850 the Warden and Society of Sutton Coldfield appointed Mr. Charles Cooper to be the Corporation Surveyor. At an Inquiry held at Sutton in 1855, Cooper gave evidence, answering questions from the lawyers. Yes, he did have the management of the Corporation estates, and yes, that included the woods in Sutton Park. He explained that each year he selected and marked the trees that were to be sold for timber, the Warden or other members of the Corporation inspected his choice, and the timber was sold at auction by the auctioneer, Mr. Kempson. Any trees not sold were left to grow another year. Traditionally, the Warden and Society had employed a surveyor to see to the sale of timber, usually with a view to raising several thousand pounds for a large capital project. Some local men had petitioned the Lord Chancellor, saying that the money so raised was not being used for the benefit of the town, contrary to the terms of the Charter, and the Lord Chancellor referred it to his Court of Chancery.in 1788. This Chancery case dragged on until 1824, and meanwhile any money from timber sales went into a reserve fund. Chancery agreed to a huge sale of timber c.1810, involving the clear felling of Hollyhurst. Thousands of oak trees were sold, of which “a large quantity”, according to Charles Cooper’s evidence, was solod “to the Navy Contractor,” - no doubt the Court of Chancery was responding to the desperate need for more warships at the time. The Park soon became a popular resort, with large numbers of visitors wishing to enjoy its wild scenery and woodland walks, so the woods became more valued for their recreational and scenic qualities than their timber. In 1890 a specialist forester was appointed to the Park staff, and he established a tree nursery in the Park with over 60,000 seedling trtees, mostly larch and pine, to be planted out when they were 3 - 5 feet tall. In 1899 the “Warden’s Belt” was extended further alongside Thornhill Road by an additional three acres. The Surveyor reported that there were already an acre’s-worth of trees growing there naturally, so it had only been necessary to plant 4,300 new trees, 500 beech, 500 elm, 500 sycamore, 500 oak, the rest conifers. The report for 1909 lists the planting of 2,025 beech, 359 oak, 220 sycamore, 232 Spanish chestnut and six spruce - there were then 30,000 trees in the nursery. Despite all the introduction of all these other species into the park Woods, the native oak and birch are still the commonest trees there. 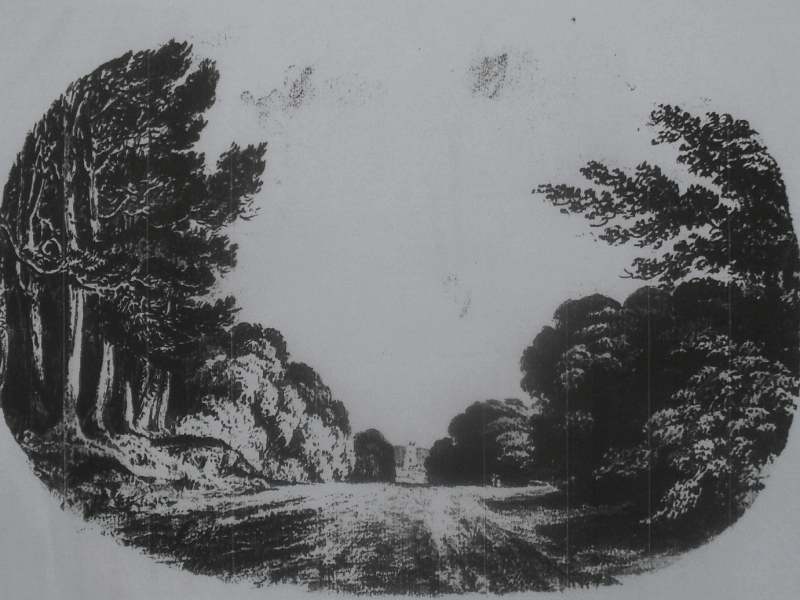 Glade in Hollyhurst drawn by Miss Bracken in 1863. This was a newly-created glade, laid out c.1810, after the clear felling of Hollyhurst for the Chancery Sale, partly to give cattle better access from one part of the park to another, but also for the scenic effect as it frames the parish church in the distance. It is now a tarmac road, and the view of the church can only be appreciated in winter when the trees are bare.